Around 2,500 people took part in the 2017 Equality March Kyiv Pride in Kyiv on 18 June. Canada’s ambassador Roman Waschuk, UK ambassador Judith Gough and Ukraine’s First Deputy Economic Minister Maksym Nefyodov joined the march. The march walked in central Kyiv, from the Teachers House in Volodymyrska Street to the Lev Tolstyy subway station, with a short detour caused by the nationalists who blocked Volodymyrska Street. Six people who attempted to break through the police cordon were detained, the Kyiv police have said. Among the detained is Kyiv city councillor Volodymyr Nazarenko from the far-right Freedom party. Kyiv police chief Andriy Kryshchenko said that charges were unlikely to be pressed. 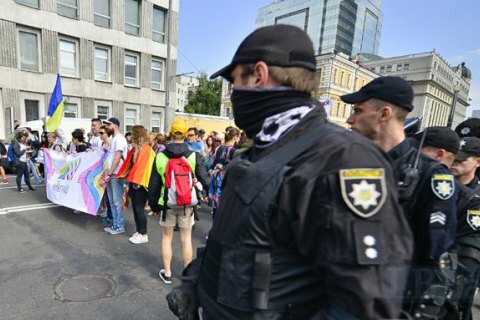 “There were some clashes with police when we were separating individuals taking part in the Kyiv Pride and their opponents. Some put up resistance to police. There were taken to a district police station. But there were no serious offences or resistance,” he said.